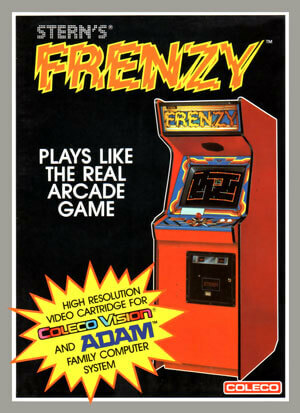 Frenzy is the sequel to Berzerk and gameplay is similar. You are chased around a maze of rooms by various robots and your player must avoid their lasers and shoot them back to destroy them. There's only so much time the player can stay in a room before a "Robot Attacks" occurs and a smiley face of death moves in on the player. In Frenzy there are also reflective mirrors in place of certain walls which reflects shots back and allow you to ricochet your fire. 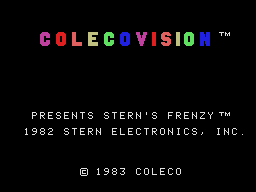 Also unique to Frenzy are four "device rooms" with a special icon in the center of the room that may be destroyed for bonus points and a special effect within that room.